Hello, I have a problem with a mid-measure clef change. 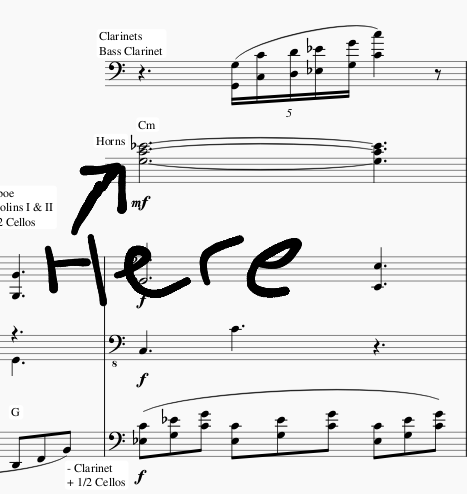 I'm doing score reduction of John Williams' Across The Stars and I want to place mid-measure clef after the barline (like first system), but no matter I click on a note (as in previous version of Musescore) or a full bar the new clef only shows at the end of the previous measure which is invisible (systems with horns and oboe). In other systems everything is what I want because I made it before in the previous software version, but now I can't open project in old version. Please, help! Any you show a picture that doesn't shwo what you want to see and assume we can see more? Instead of that I want to place this clef at the beggining of the next measure. I will send score for a moment. Will have a look at this tomorrow. I think I should open that in 2.3. version and do what I want but are there any ways to open project from new version in the old one? Possibly #282625: clef change to first note of a measure shows the clef before that measure rather than before that note?